It’s almost that time of year again… The Edinburgh Festival is fast approaching!! Scotland’s capital city is soon to be buzzing with people coming from all over to visit the World’s Largest Ever Arts Festival. It’s exciting for me as an artist to be part of this huge event and I can’t wait to exhibit my jewellery as well as go and check out some of the amazing things going on. If you’re visiting the festival this year you may feel overwhelmed as to what you should do and see, there are 3,426 shows which vary from theatre, comedy, musicals, exhibitions, circus shows, the book fair, children’s shows and the list continues. The festival is called many things, including The Edinburgh Fringe, https://www.edfringe.com/ Edinburgh International Festival, http://www.eif.co.uk/ or Edinburgh City Festival http://www.edinburghfestivalcity.com/ or just The Edinburgh Festival. It gets confusing!!! You could have a look through the festival brochure, but bear in mind that it is 438 pages long and the festival could well be finished by the time you’ve read it. It obviously depends what type of things you enjoy watching but there is definitely something for everyone at the festival and if you’re taking your kids then there is more than enough fun things to keep them occupied. 1. Key Change’ – This theatre stage show caught my eye, it is a raw and illuminating portrayal of women in prison, using only 4 chairs, a ghetto blaster and four rolls of masking tape. It’s devised by women from HMPYOI Low Newton and originally toured male prisons. Sounds interesting and could suit fans of ‘Orange is the New Black’. 3. Circus – This year the circus is coming to Edinburgh Festival but maybe not as you would think. “Circus is not necessarily clichéd, hack, silly stuff in a big tent” said promoter Charlie Wood. Underbelly, one of the four biggest venues at the festival, is to erect two big tops on Edinburgh’s Meadows that for three weeks will be home to a programme of contemporary circus acts from around the world. There are various acts to watch out for including ‘Ockham’s Razor’, ‘Cirk la Putyka’, ‘Trash Test Dummies’ and many more! 4. The Magic Flute – Mozart’s masterful comedy has a radical restaging which will blend animated film and live action in a spectacular kaleidoscope of 1920’s silent movies, Weimar cabaret, dark humour and expressionism. With huge spiders, Nosferatu, demons, butterflies and wolves, this wildly inventive ‘The Magic Flute’ is like no other. 5. The Outsider – This theatre performance looks very interesting! It’s about someone who suddenly wanders onto Earth and bumps into modern humanity. It’s described as a “delightful fantasy for grown-ups which has gathered standing ovations around Europe.” The performance evokes the style of silent films which has amazing 4D effects. 6. Nina Conti – This is sure to be one of the biggest comedy acts at the festival this year, so you’ll be lucky if you can still get a ticket! She’s won a British Comedy Award, stormed ‘Live at the Apollo’ and ‘Russell Howard’s Good News’ all without moving her lips. She creates a new show every night by selecting people from the audience and she’ll have you laughing the whole time. There are various performances and reasonable ticket prices, so this is a must whilst you’re at the festival. 7. The West End Fair – This is Scotland’s largest contemporary art, craft and design fair! If you’re looking to do some shopping whilst at the festival, then this is the place to do it. With over 100 makers, the fair is full of unique stalls selling products that you’d never see on the high street. You can find stunning handmade jewellery, furniture, fashion, accessories, homeware, art, photography and much more! The fair is free entry and you can easily spend a few hours browsing through the stalls. The fair is mainly outside in little huts as well as some larger marquee tents next to the St John’s Church! The fair is on every day from August 8th-30th, 11am-6pm. 8. 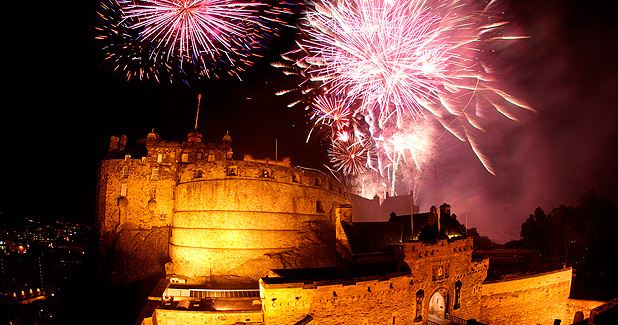 The annual Edinburgh Festival Fireworks – This will be a spectacular 45 minute display on Sunday 31st August at 9pm. I love watching the fireworks above the Edinburgh Castle, it’s simply a stunning view and the perfect way to end the festival. Beneath this you can see the world renowned Scottish Chamber Orchestra play in ‘Ross Band Stand’, although you will need a ticket for this, but you may also tune into the radio to hear the performance as you watch the fireworks! They can of course by viewed from Princes Street, Waverly Bridge, Castle Street etc. 9. Military Tattoo – The Tattoo is an iconic Edinburgh event which sells out every single year. With music, dance and precision display with the Massed Pipes and Drums, the Massed Military Bands, cultural troupes, singers and much more against the stunning backdrop of the Edinburgh Castle. Every Tattoo is different from the last, more than 13 million people have attended the Tattoo with an annual audience of around 217,000. As well as this roughly 100 million people see the Tattoo every year on international television. It goes without saying that if you can get a ticket for this, then you are in for a treat! My number 1 thing to do at the Edinburgh Festival is simply this… Take it all in and enjoy the experience! Take time to stroll through the city, try some new food, go and see a couple of shows, buy some unusual gifts and meet some new people. There is so much energy and creativity around you, this should be embraced. Share a laugh with some friends and create great memories at this amazing annual event. I hope you have found this helpful. If you do visit the festival this year please comment below. Tell me know where you went and what show was your favourite!